Analysis: With the receiving corps otherwise intact, Benjamin will be in street clothes for a second consecutive contest. Behind Tyreek Hill and Sammy Watkins, expect Chris Conley to step into three-wide sets, while Demarcus Robinson and Gehrig Dieter pick up any lingering snaps. 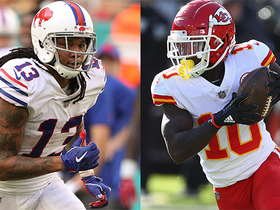 Analysis: With Sammy Watkins (foot) back in the lineup, Benjamin is the odd man out in an otherwise healthy receiving corps. Aside from Tyreek Hill and Watkins, Chris Conley and Demarcus Robinson should scoop up the remaining reps at wide receiver in the snowy conditions at Arrowhead Stadium. 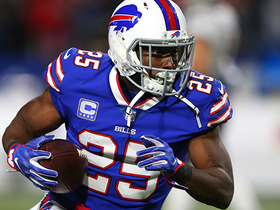 Analysis: Benjamin was released by the Bills in early December after his role with the club continued to diminish. After sitting a week to get acclimated, Benjamin got his chance to contribute with Sammy Watkins (foot) unavailable. He logged a maximum of 12 offensive snaps in his three weeks with the club and heads into the offseason as a free agent. Benjamin should find some suitors, but he's unlikely to secure a long-term deal after a disastrous 2018. Analysis: Benjamin disappointed with the Bills this season before being released earlier this month. He'll now look to get things going with the Chiefs and may carve out a solid role with the team down the stretch if Sammy Watkins' foot injury lingers. That said, we'd like to see Benjamin get a full and productive game in before recommending him as a fantasy lineup option. Benjamin expects to suit up for Thursday's game against the Chargers, Omar Ruiz of NFL Network reports. Benjamin (coach's decision) is inactive for Sunday's game against the Ravens, Adam Teicher of ESPN.com reports. Coach Andy Reid admitted Friday that it's unlikely Benjamin will be active for Sunday's game against the Ravens, Brooke Pryor of The Kansas City Star reports. Reid said the newly signed wideout will have a more realistic shot at playing in the Chiefs' Thursday night matchup with the Chargers in Week 15. Benjamin will sign with the Chiefs, Adam Schefter of ESPN reports. 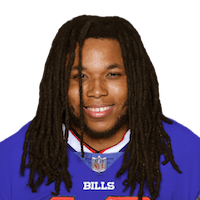 Analysis: Benjamin's stint with the Bills was disappointing and led to his release, but in the right team context, he has the size and experience to be an asset. KC could be a good fit, especially if wideout Sammy Watkins' foot issue persists. The Bills have released Benjamin. Analysis: The team also released Andre Holmes on Tuesday, which leaves Zay Jones, Robert Foster and Isaiah McKenzie as the team's top options at wideout. Benjamin, who logged 23 catches for 354 yards and a TD in 12 games for the Bills, could catch on elsewhere in short order, but he has much to prove before re-surfacing on the fantasy radar after being cut by a team that is desperate for pass-catching talent. Benjamin caught two of four targets for 20 yards during Sunday's loss to Miami. Analysis: Has someone looked under the helmet to make sure this is the same player that caught 18 touchdowns over two and a half seasons with the Panthers. 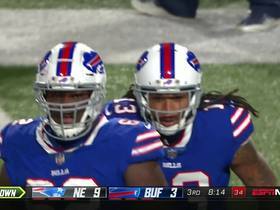 Benjamin hasn't seen the end zone for the Bills since Week 2, and has bettered 50 receiving yards just once all season. Zay Jones has easily passed by him as an offensive contributor, and others have been much more involved as well. Benjamin needs to end up in a different city this offseason to even be in the discussion again. 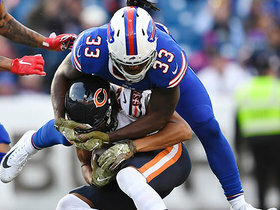 Coach Sean McDermott acknowledged Friday that Benjamin has seen his snap counts trail off the last two games due to the organization's desire to give some of its younger receivers more opportunities, Joe Buscaglia of WKBW.com reports. Benjamin caught one of two targets for 32 yards in Sunday's 24-21 win over Jacksonville. Benjamin failed to haul in any of his three targets during Sunday's 41-10 win over the Jets. Benjamin (knee) practiced fully for the second straight day Friday and does not have an injury designation for Sunday's game against the Jets. Benjamin (knee) was a full participant in Thursday's practice. Benjamin was a limited participant at Wednesday's practice due to a knee issue. Analysis: Given that the Bills staged their first practice of the week and Benjamin was able to work in some capacity, his knee issue is likely a minor one. Still, it's just another mark against the once-useful fantasy wideout, who can add it to a laundry list of shortcomings that includes his inability to gain separation from corners, playing in the NFL's worst offense, shaky quarterback play, etc. Benjamin caught four of nine targets for 40 yards in Sunday's 41-9 loss to the Bears. 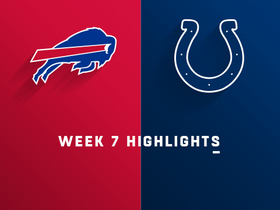 Analysis: Benjamin tied for the team lead in receiving yards, as Buffalo's offense was stuck in low gear with quarterback Nathan Peterman averaging 3.9 yards per attempt. 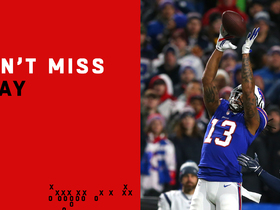 The big-bodied receiver would benefit from the return of Josh Allen (elbow) or Derek Anderson (concussion) under center against the Jets in Week 10, though it's hard to get excited about Benjamin considering he's topped 50 yards only once this season while failing to score a touchdown since Week 2. Kansas City Chiefs wide receiver Kelvin Benjamin makes his first catch as a Chief for 17 yards. 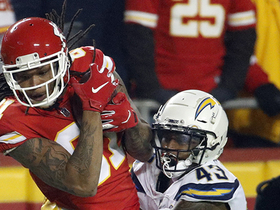 NFL Network's Omar Ruiz reports the latest on the status of Kansas City Chiefs wide receivers Kelvin Benjamin, Tyreek Hill ahead of their "Thursday Night Football" matchup with the Los Angeles Chargers. The "NFL Fantasy Live" crew discuss Tennessee Titans running back Derrick Henry's dominant performance in Week 14 against the Jacksonville Jaguars. 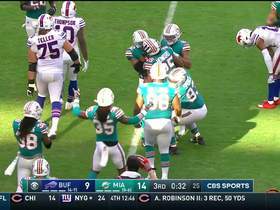 Miami Dolphins cornerback Xavien Howard intercepts Buffalo Bills quarterback Josh Allen. 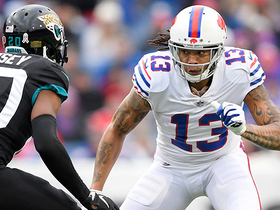 Buffalo Bills wide receiver Kelvin Benjamin makes a 32-yard catch. 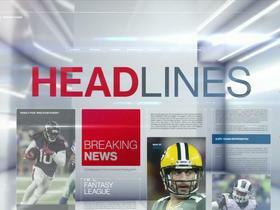 The "NFL Fantasy Live" crew discuss which players you should avoid starting in Week 9.